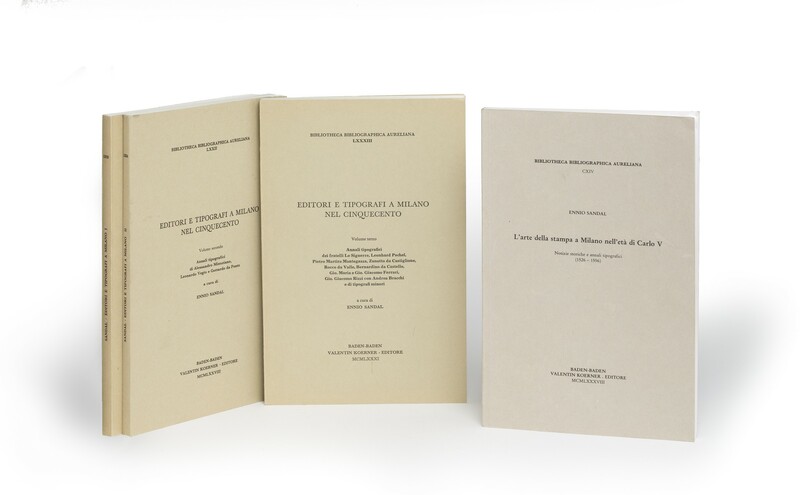 Four volumes (24 cm), I (1977): 89 (3) pp., illustrations. 154 catalogue entries. II (1978): 100 (2) pp. Entries 155-384. III (1981): 156 (2) pp. Entries 385-699. [L’ arte della stampa a Milano] (1988): 148 pp. Uniform publisher’s printed wrappers. - In his work Editori e tipografi a Milano nel cinquecento Sandal describes 699 editions, published 1501-1552, with essays on “La tipografia milanese”, “Il Libro illustrato milanese del Cinquecento”, and “Il frontispizio del libro milanese del primo Cinquecento” and an “Indice cronologico delle edizioni milanesi dal 1501 al 1524/25” (around 720 editions). L’ arte della stampa a Milano nell’età di Carlo V contains 327 entries. Publisher’s retail prices are €128 and €40 respectively (www.koernerverlag.de/). ¶ Fine, unmarked copies. 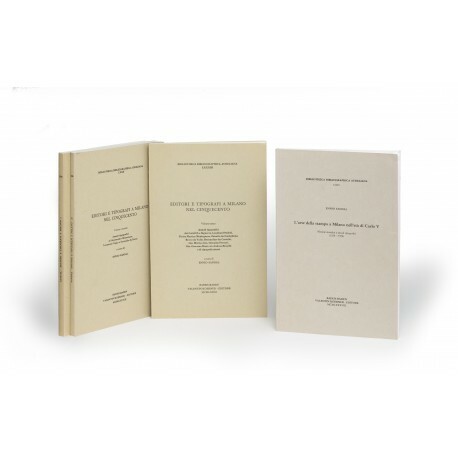 Three volumes (24 cm), I (1977): 90 pp. II (1978): 101 pp. III (1981): 157 pp. Uniform publisher’s printed wrappers. - 699 editions published 1501-1552 are described. Publisher’s retail price €128 (www.koernerverlag.de/). ¶ Unmarked copy. (24 cm), 148 pp. Publisher’s printed wrappers. - 327 entries. Publisher’s retail price €40 (www.koernerverlag.de/). ¶ Unmarked copy.